A group of cancer researchers in Japan has retracted their 2011 paper in the journal Medicine. The reason: They seem to have had some trouble — well, perhaps a bit more than some — with their patient population. The article, titled “Usefulness of systemic CT scanning in the detection of malignant lymphadenopathy,” came from the lab of Norio Komatsu, a hematologist at Juntendo University School of Medicine. We developed a prediction model to distinguish between malignant and nonmalignant lymphadenopathies. We first analyzed clinical features of 222 patients with lymphadenopathy (161 malignant and 61 nonmalignant) in the derivation group. Through logistic regression analysis we identified 6 covariates that independently predict malignancy: age (X1), abdominal lymphadenopathy (X2), lymphadenopathy of the other sites (X3), number of enlarged lymph node regions (X4), absence of fever (X5), and largest lymph node size (X6). We determined the formula as follows: predictive score=-2.3+x1+2.8×2+1.3×3+1.6×4-2.2×5+1.8×6.A higher score correlated with increased likelihood of malignancy. With the cutoff value of 0.4, the sensitivity and specificity of the model were 91.9% and 77.0%, respectively. The validation study using 117 cases (82 malignant and 35 nonmalignant) yielded 90.2% sensitivity and 68.6% specificity. A maximum lymph node size of less than 2.0 cm on systemic computed tomography (CT) scanning indicated a low probability of malignant lymphadenopathy. In this model, 4 of the 6 covariates were obtained by CT scanning, which strongly indicates the usefulness of initial evaluation with systemic CT scanning in the detection of malignant lymphadenopathy. But the 2011 paper evidently was not so useful after all. 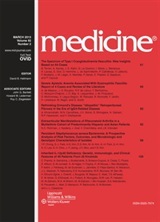 We published the article ‘‘Usefulness of Systemic CT Scanning in the Detection of Malignant Lymphadenopathy’’ in the November 2011 issue of Medicine. It has come to our attention that we made an error, and 143 cases of the 339 cases analyzed did not fit the criteria for patient selection described in the Patients and Methods section. In addition to the 143 cases without complete data, 5 cases originally categorized in the benign group because of benign pathologic results turned out to have active malignancies. When we re-evaluated the corrected data in logistic regression analysis, we found that only 2 of the 6 covariates identified in the paper as independently predicting malignancy were significant. As a result, we wish to retract this article. We regret any problems our article and actions may have caused and we retract this article from the literature. In other words, fully 42% of the study patients shouldn’t have been in the trial after all. But the line that follows that one is curious: was the issue that the subjects didn’t meet the inclusion criteria, or that the investigators didn’t have adequate information about them — which might be the same, but might not? Finally, the bit about the mistaken tumor status of five patients is discomfiting. Does it mean that five patients were misdiagnosed with benign tumors, only to find out (in time for treatment, we hope) that their doctors were wrong? This looks like a retrospective study, so this may have just been poor data management. The paper has yet to be cited, according to Thomson Scientific’s Web of Knowledge. We’ve contacted some of the people involved, and will update with anything we learn.